So, anyone else out there already dying from that intense sun? I know it's only spring, but where we live the sun can be a nightmare, especially when we're in the car. This set of car accessories helps quite a bit. Let me show you what I mean. 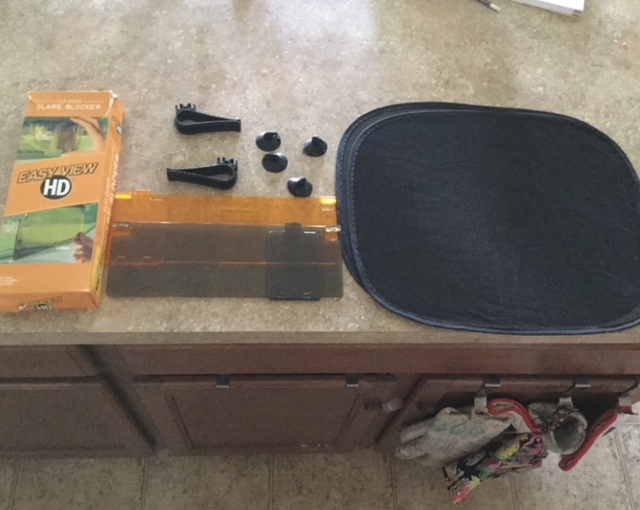 So, it includes two sun glare blockers, hooks to attach them, two window sun shades, and suction cups to attach those. Once attached to the hooks, you can hook one glare blocker, or both, onto one of the mirrors in the front seat. One is an orange yellow and the other is black. Then, when not in use, you can simply flip it back up. This is the black one, flipped up. Here it is, flipped back down. These glare blockers work well on either the driver or passenger side. Good for driving in bright sunlight or I was told you could use them in the evening when there are bright headlights too. There is a small sliding screen, as you can see in the pictures above, that you can slide in front of you for a bit of extra protection for your eyes. You see how you can just flip your mirror back up, with no issue, even when they are attached? What's nice is that you can also move it to the side to protect yourself a bit from incoming sunlight. These bonus sun shades are nice as well. They can be used on any of the side windows of your vehicle. I like them most in the backseat for my children. Even more wonderful if you have a car seat back there and don't want the sun blazing in your baby's little face. Any Cons about this product set? Not really. The instructions were a little confusing, in my opinion, but they're not really necessary. Just by looking at the images on the box and on Amazon, I was able to figure out how to attach the glare blockers onto the plastic hooks. You, do, however, have to try and do it gently so that you don't break off the tiny pieces that slide right in. The shades were even easier to figure out. They can be folded a certain way, for storing, when not in use.